I love the Fourth of July, I love spending time with friends and family and especially the fireworks. I did have a really great shot of the fireworks but accidentally deleted it before transferring it to my computer, whoops! We spend the first half of the day over at a friends home BBQing, playing yard games and fishing. They even pulled out the kayaks after we left, he lives along this beautiful creek, there is a pic in the gallery that you can take a peek. Zach makes these great fishing kits that will turn any stick into a fishing pole, he tested it out himself on Friday and caught a half dozen fish. Some were larger than the one shown, I’m proud either way. Zach and I attempted a game of ladderball but it was just embarrassing we did eventually get some points so that we weren’t skunked, I am focusing on the positive. 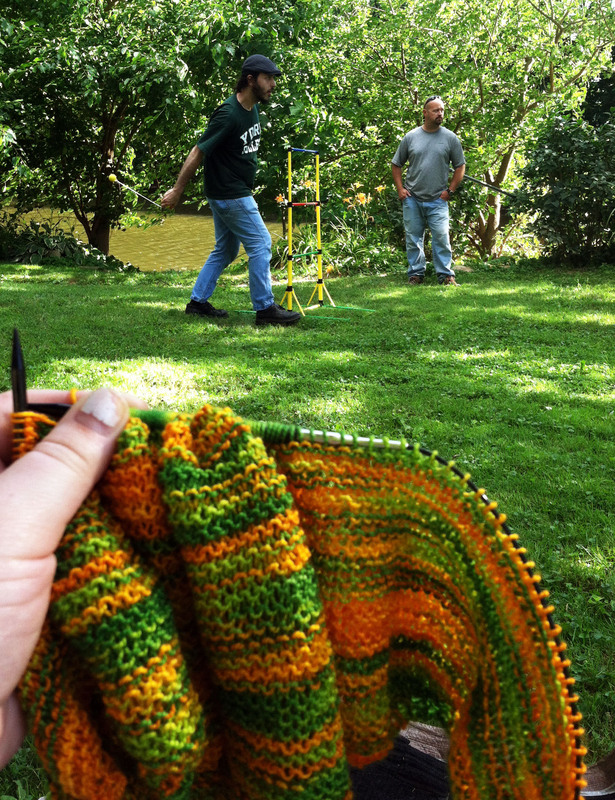 I decided that I would be a better member of the peanut gallery and grabbed my current shawl to work on while enjoying the perfect weather that didn’t include humidity. In the evening we headed over to my mother-in-law’s house to pick her up for dinner down by the Susquehanna River. After dinner we just hung out in the car since the parking lot is right next to where they where shooting off the fireworks. It was perfect, we were right under the explosions and had comfy seats for the hour before they started. So for the Still on the Sticks projects, I have three currently. The hat is technically not still on the sticks but I do need to finish the pom poms to be completely done. It was inspired by the wonderful invention that is Limeade Oreos. Find them, buy them, love them. I also am working quickly through a curved shawl. it is worked similar to a triangle shawl just no increases in the middle and there are increases at the start and end of every row. It is moving along quickly, which I’m happy about since this is a second go around, I didn’t like how the first one was turning out. The blue hat I actually started today because I became panicked that I don’t have enough hats for men when I do craft shows. The sane part of my brain is telling me I don’t have a craft show until the end of September so there really isn’t a reason to panic. But there really it is the middle of July HOW DID THAT HAPPEN!!!! The year is half gone. Here’s to the second half. Alright this is not the post I was planning, wordpress has decided to update how to put a post together I guess. It looks completely different and I have no idea where the “add media” went and I’m missing the preview selection too. So hopefully this isn’t to random. Never mind after I posted it I was able to come back and edit it with the full options, but has anyone run into this problem?